Launched to great fanfare in December, China’s Jade Rabbit moon lander has experienced a “mechanical control abnormality” 42 days into its three-month mission. The craft’s main camera has failed and it’s speculated that one of its solar panels may not have folded up during the 14-day lunar night to protect its temperature-sensitive instruments. China’s quiet: Because China’s space program is coordinated by the military, the country isn’t transparent on the current status of the Jade Rabbit. “The Chinese will have to say something about it,” said BBC Science Editor David Shukman. But the contrast with the Americans “is striking…If something goes wrong like the Apollo 13, it was all there open for everyone to see,” he said. “With this (Jade Rabbit mission) we’re teasing out little fragments of information.” The lack of information speaks to an emerging feature of space competition, the general opacity of certain governments. This could become an issue in future competition. China’s space future: China will continue to explore space. 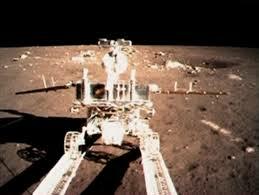 The Chinese have a long-term program for the moon. They have future missions planned, including manned missions to the moon. Said BBC’s Shukman: “This won’t stop them. This is a step back. This won’t stop them. It’s an embarrassment but it won’t stop them.” The Jade Rabbit moon lander is one of only a handful of projects pursued by the People’s Republic of China, including the Tiangong-3 “HeavenlyPalace” space station scheduled to orbiting earth by 2023. Russia: China is not alone in its lunar ambitions, as the Russians have recently announced plans to return a rover to the moon. Russia plans to launch the Luna-Resurs-1 Moon orbiter in 2016, as well as a Martian rover two years later, according to Chinese media. “Last December, Lev Zelyony, director of the RussianAcademy of Science’s Space Research Institute, said Russia has set ambitious goals to regaining the title of leading space power by 2023,” Xinhua reported. While Russia has been busy ferrying cosmonauts – and even US astronauts – to space, not all are convinced by Russia’s plans. Space analyst Dr Jones, however, doesn’t have high hopes for the Russians. “[The Russians) will probably launch the lunar mission they mention, but their planetary exploration program is very sick,” he said. The United States: Where is the US in all of this? The biggest news from the US isn’t about moonshots but the decision to extend the life of the International Space Station at least until 2024- no doubt with one eye on China’s recent strides. As one observer noted, the increased investment in the ISS helps keep space technology in a pre-competitive phase both for allies and competitors alike. This is important, because the commercialization of space could kick off a new level of competition, the first wave we’re only seeing now.